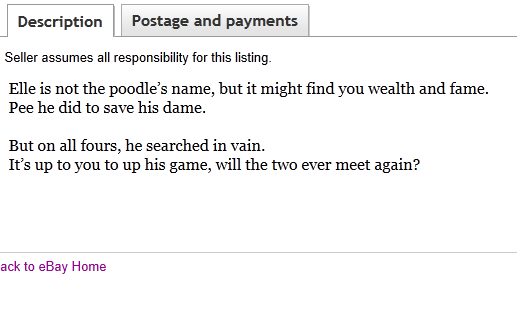 "CLUE #7: Seeing the poodle's little bow has made me all poetic. So here's today's clue. To get past the task, put together two and two." Okay, to be honest, today's task was not easy. And for all of you who are still having problems with the task, here's a step by step solution to it. 1. Open the commercial. Unlike the previous tasks, there would not be a high pitched cue for you to tap the screen today. So you have to roughly guess where you should tap the screen based on the clue. 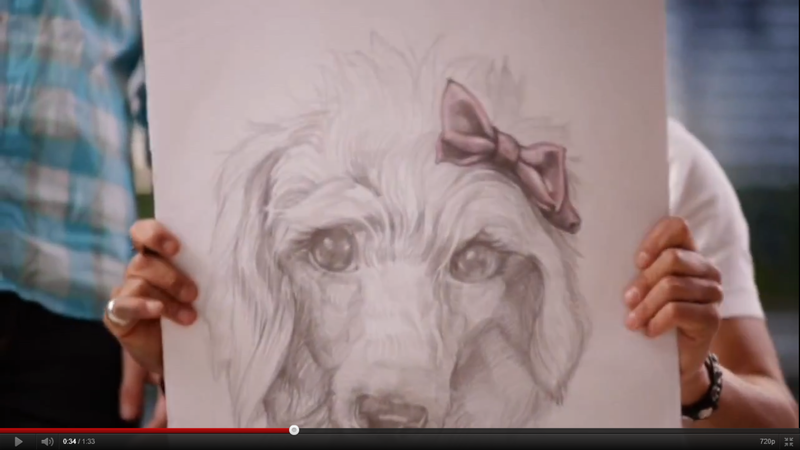 It's around 0:32 seconds onwards when the artist added the bow unto the drawing of the poodle. 2. The app will then bring you to a video (for some reason I can't view the video) and a snapshot of a bow being sold on some website. 3. Based on the snapshot, head on to ebay.com.sg and search for "The Most Beautiful Bow in the World" and you'll probably end up with a result that is similar to the snapshot shown. 5. Put together both clues, with L from "Elle", P from "Pee", 4 from "Four" and 2 from "Two" and you'll get the answer to unlock map 7, LP42. 2. You may need to be a frequent shopper at ebay to recognize that the snapshot came from ebay. 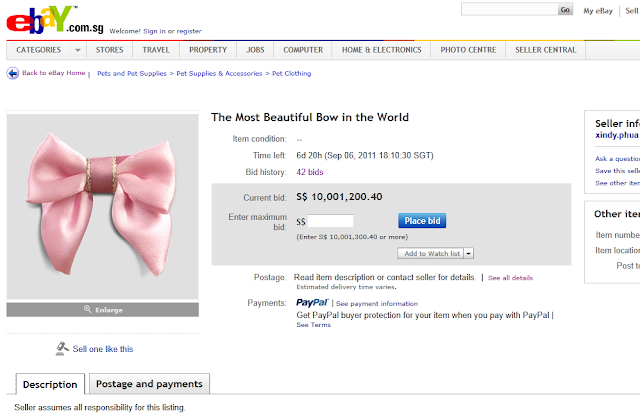 The first time I saw the photo, the last thing that came to my mind was going to ebay.com.sg and type in "The Most Beautiful Bow in the World". The only indication was go shopping. Boo to us who never shop online before. 3. LP42. Don't ask how I decode that because I have no idea either. How would Elle translate to L and Pee translate to P while Four and Two becomes a number. I guess it was the pronunciation of Elle and Pee but still, it's kinda hard to guess which word to use and which not to. I guess it's a matter of trials and errors until you get the right combination. A lot are complaining about the app though and how it doesn't respond and things like that, from what I see from StarHub's Facebook page, but I guess we all should cut them some slack. This is after all, the first time such a big interactive campaign is organized (and with so many prizes) in Singapore so there's bound to be hiccups here and there. It's unavoidable. And I'm sure that the people at StarHub are working their best to give everyone a good experience too (designing an interactive app is never easy) so just have a little patience and have some fun along the way. Who knows, there might be more interactive campaigns in the future in which the experience you acquire now would help you much in that future campaign. Besides, there's still the grand prize and loads of other prizes to be won so who knows you might get lucky the next round?